Lifting Gear Hire (LGH) is the leading expert in the rental of hoisting and rigging equipment with an unmatched reputation for safety, quality, and reliability. LGH sets the industry standard with our extensive rental inventory. The expertise and knowledge of our workforce is unsurpassed. The LGH team shares a common purpose to serve our customers with passion, motivation, and dedication, as we continually work together to exceed all expectations. Throughout over 20 locations in North America, supported by local Rental Representatives nationwide, LGH can provide, for rent, hoisting, pulling, jacking and rigging, safety and material handling equipment for every conceivable lifting or moving need. LGH does this by holding the most comprehensive inventory of lifting equipment. Whether for simple everyday tasks or for special projects where expertise has to be matched with availability of the right equipment in sufficient quantity. Every piece of equipment has been carefully selected by LGH for its durability and longevity. All rental stock is maintained in superior condition to be ready for immediate and, above all, safe use. Having recently celebrated its 25th anniversary, Lifting Gear Hire (LGH) has been serving professionals in all types of industries. Since the beginning, LGH has had tremendous success and today, LGH is the United States’ largest single organization devoted exclusively to the provision of lifting and moving equipment for rent. The LGH mission is genuine and simple…LGH’s mission is to offer expertise in the rental of the safest and most reliable hoisting and rigging equipment to build and support a better North America. At LGH, we value our customers and strive to provide them quality service with our vision in mind. 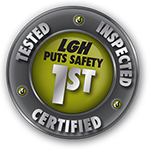 Our Vision is… LGH is the leading expert in the rental of hoisting and rigging equipment with an unmatched reputation for safety, quality, and reliability. LGH sets the industry standard with our extensive rental inventory and the expertise and knowledge of our workforce is unsurpassed. The LGH Team shares a common purpose to serve our customers with passion, motivation, and dedication, as we continually work together to exceed all expectations. At LGH, we carry out an annual program of internal audits at each rental center, looking at both operational and administrative practices and procedures. In addition to monitoring our administrative efficiency, we also carry out in-depth audits of all workshop practices; examining equipment, maintenance, personnel efficiency, and safety. The success of LGH relies very much on the emphasis we place on staff training — both in-house and training seminars by our key suppliers.LGH provides training for all rental staff, together with comprehensive courses for distribution center personnel in our fully-equipped centers. The aim is to improve safety and training skills in line with specific safety requirements, as well as to promote the effective and safe use of our lifting and moving equipment. Practical workshop activities are presented to our in-house staff. Every one of our training programs meet, and in many cases, exceed statutory and legal requirements. LGH has a 125,000 lb Dynamic Vertical Proof testing machine capable of dual load range testing as well as a 72 feet long, 300,000 lb Dynamic Horizontal Proof testing machine that has fixtures for winch mounting and is fully equipped with a computer installed with data test software. This testing equipment was added in a conscious effort to deliver safe equipment to our customers. Just another way for us to make sure we put your safety first. Service and maintenance are very important activities within LGH’s total sphere of operations. Over the years, we have developed these functions to ever-greater heights at our locations to ensure that we sustain our leadership in the market and our reputation for quality in the rental field. In many industries, the duration of a lifting or moving operation is most frequently only short or medium term. Consequently, the need for equipment often runs along those same lines. Whenever that happens rental can offer economic advantages over outright purchases. For example, you do not have to worry about equipment records, maintenance or certification. You also delegate the burden of legal obligation. Renting means that you can forget about long term equipment storage space, letting our rental center stock virtually ‘become’ your inventory. Renting also allows for more accurate project cost control, and since it does not involve capital costs, it therefore frees your capital for other uses. When you rent you do not have to make do with limited or obsolete equipment. You can choose exactly the right piece of equipment to do a specific job, effectively and safely. Sometimes a customer has a consistent requirement of a specific piece of equipment or just prefer to buy rather than rent for individual need or preference. When that happens, Lifting Gear Hire offers a wide portfolio of products for sale. This portfolio includes items which, based upon our long experience, have been chosen because they have proved to be extremely durable and ready to use as well as providing serviceability and value. Rental gives a product the ultimate test of constant, varied use. LGH chooses wisely and offers its customers the same choices. As leaders in the lifting engineering industry, we continuously improve our standards, and have continued to set the standards throughout the lifting and engineering industry. We go steps beyond what is required in our commitment to statutory and legal obligations in the inspection of our equipment. We have our own range of testing equipment, where necessary, to simulate equipment working conditions as closely as possible. However, safety goes beyond equipment, making training equally crucial at LGH. We insist that all of our staff are trained to the highest degree possible to fulfill their particular job function. To that end, staff is trained 90 hours at a minimum. LGH is very much a customer-focused organization. You can take comfort in knowing that everyone on our service team, from our national rental center, to our rental representatives in the field, and from rental center staff to the delivery people recognize that when it comes to your needs, being second best is just not good enough. Not for our customers and therefore, never at Lifting Gear Hire. As the industry leader, we take pride in providing each customer with top notch service. That is why we are constantly developing our superior service standards, processes, and employees.